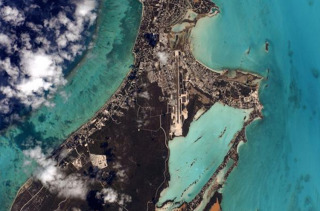 A photo taken by astronaut Scott Kelly from the International Space Station is the first in a weekly geography quiz game that Kelly will run on Twitter. You might know what Earth looks like on the ground, but how good are you at identifying terrestrial locations from above? Astronaut Scott Kelly, who recently arrived at the International Space Station for a one-year stay, has kicked off a weekly geography game on Twitter. Kelly will tweet photos of locations on Earth as seen from space, and players must identify them correctly to win. Below is the first quiz photo, posted yesterday. More information about the contest can be found here. Kelly will continue the #SpaceGeo game for the entirety of the one-year mission. Winners will receive their signed photographs after Kelly returns to Earth in March 2016. Astronaut Terry Virts has started a similar game, asking people on Twitter to identify American baseball stadiums based on photos he takes from the orbiting outpost. The International Space Station orbits 220 miles (354 km) above the Earth's surface, and travels at 17,500 mph (28,200 km/h). At this incredible speed, the station circles the planet more than a dozen times per day. With the rise of low-cost, lightweight cameras, photographing Earth from space has become a common activity among astronauts. Along with cosmonaut Mikhail Kornienko, Kelly will spend just less than a year aboard the space station — the longest that any astronauts have consecutively lived on the orbiting outpost (they are not the first humans to spend a year in space, however). The one-year mission is designed to test the effects of long-term spaceflight on humans, which could affect the feasibility of a crewed mission to Mars or other distant locations.